The AppFuse Team is pleased to announce the release of AppFuse 3.5. This release contains a number of improvements. For more details on specific changes see the release notes. AppFuse is a full-stack framework for building web applications on the JVM. It was originally developed to eliminate the ramp-up time when building new web applications. Over the years, it has matured into a very testable and secure system for creating Java-based webapps. Demos for this release can be viewed at http://demo.appfuse.org. Please see the QuickStart Guide to get started with this release. If you have questions about AppFuse, please read the FAQ or join the user mailing list. If you find any issues, please report them on the users mailing list. You can also post them to Stack Overflow with the "appfuse" tag. Thanks to everyone for their help contributing patches, writing documentation and participating on the mailing lists. We greatly appreciate the help from our sponsors, particularly Atlassian, Contegix, and JetBrains. Atlassian and Contegix are especially awesome: Atlassian has donated licenses to all its products and Contegix has donated an entire server to the AppFuse project. 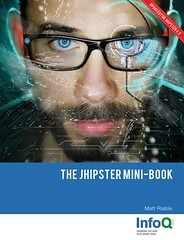 I've been intrigued by JHipster ever since I first tried it last September. I'd worked with AngularJS and Spring Boot quite a bit, and I liked the idea that someone had combined them, adding some nifty features along the way. When I spoke about AngularJS earlier this month, I included a few slides on JHipster near the end of the presentation. This week, I received an email from someone who attended that presentation. We met a few weeks back when you presented at DOSUG. You were talking about JHipster which I had been eyeing for a few months and wanted your quick .02 cents. I have built a pretty heavy application over the last 6 months that is using mostly the same tech as JHipster. It's ridiculously close for most of the tech stack. So, I was debating rolling it over into a JHipster app to make it a more familiar stack for folks. My concern is that it I will spend months trying to shoehorn it in for not much ROI. Any thoughts on going down this path? What are the biggest issues you've seen in using JHipster? It seems pretty straightforward except for the entity generators. I'm concerned they are totally different than what I am using. The main difference in what I'm doing compared to JHipster is my almost complete use of groovy instead of old school Java in the app. I would have to be forced into going back to regular java beans... Thoughts? JHipster is great for starting a project, but I don't know that it buys you much value after the first few months. I would stick with your current setup and consider JHipster for your next project. I've only prototyped with it, I haven't created any client apps or put anything in production. I have with Spring Boot and AngularJS though, so I like that JHipster combines them for me. JHipster doesn't generate Scala or Groovy code, but you could still use them in a project as long as you had Maven/Gradle configured properly. You might try generating a new app with JHipster and examine how they're doing this. At the very least, it can be a good learning tool, even if you're not using it directly. Java Hipsters: Do you agree with this advice? Have you tried migrating an existing app to JHipster? Are any of you using Scala or Groovy in your JHipster projects? In November, I had some time off between clients. To occupy my time, I exercised my body and brain a bit. I spent a couple hours a day exercising and a few hours a day working on AppFuse. AppFuse isn't used to start projects nearly as much as it once was. This makes sense since there's been a ton of innovation on the JVM and there's lots of get-started-quickly frameworks now. Among my favorites are Spring Boot, JHipster, Grails and Play. You can see that AppFuse's community activity has decreased quite a bit over the years by looking at its mailing list traffic. Even though there's not a lot of users talking on the mailing list, it still seems to get quite a few downloads from Maven Central. I think the biggest value that AppFuse provides now is a learning tool for those who work on it. Also, it's a good place to show other developers how they can evolve with open source frameworks (e.g. Spring, Hibernate, JSF, Tapestry, Struts) over several years. Showing how we migrated to Spring MVC Test, for example, might be useful. The upcoming move to Spring Data instead of our Generic DAO solution might be interesting as well. This article is the third in a series on Apache Camel and how I used it to replace IBM Message Broker for a client. I used Apache Camel for several months this summer to create a number of SOAP services. These services performed various third-party data lookups for our customers. For previous articles, see Part I: The Inspiration and Part II: Creating and Testing Routes. Is it OK to integrate Spring Boot? Should I split the project into microservices? Both of these suggestions were well received, so I went to work. This article is the second in a series on Apache Camel and how I used it to replace IBM Message Broker for a client. The first article, Developing Services with Apache Camel - Part I: The Inspiration, describes why I chose Camel for this project. Write an integration test pointing to the old service. Write the implementation and a unit test to prove it works. Write an integration test pointing to the new service. I chose to start by replacing the simplest service first. It was a SOAP Service that talked to a database to retrieve a value based on an input parameter. To learn more about Camel and how it works, I started by looking at the CXF Tomcat Example. I learned that Camel is used to provide routing of requests. Using its CXF component, it can easily produce SOAP web service endpoints. An end point is simply an interface, and Camel takes care of producing the implementation. In early May, my client asked me to work on a project migrating from IBM Message Broker 6.1 to an open source solution. Their reason was simple, the IBM solution was end of life and outdated. To prove how out of date it was, the Windows version required Windows XP to run. IBM WebSphere Message Broker has been replaced by IBM Integration Bus in recent years, but no upgrade path existed. At first, I didn't want to do the project. I was hired as a Modern Java/UI Architect and I had enjoyed my first month upgrading libraries, making recommendations and doing a bit of UI performance work. I hadn't done much with ESBs and I enjoy front-end development a lot more than backend. It took me a couple days to realize they were willing to pay me to learn. That's when I decided to clutch up, learn how to do it all, and get the job done. This article is the first in a series on what I learned during this migration project. My approach for figuring out how everything worked was similar to working on any new application. I get the source code, install the software necessary to run it, and run it locally so I can interact with it. I keep seeing you recommending IntelliJ. I keep trying it intermittently with using Eclipse, but I feel like I'm missing something obvious that makes so many people think it's better. Granted having the usual plugins incorporated is nice, but other things like the build process and debugger sometimes seems a step back from Eclipse. Could you please blog a '10 reasons why I love IntelliJ' or point me to something that would clue me in? I grew to love IntelliJ for a few reasons. It all started in 2006 when I decided to migrate AppFuse from Ant to Maven. Before that, I was a huge Eclipse fan (2002 - 2006). Before Eclipse, I used HomeSite, an HTML Editor to write all my Java code (1999-2002). Eclipse was the first IDE that didn't hog all my system's memory and was pleasant to work with. The reason I started using IntelliJ in 2006 was because of it's multi-module Maven support. Eclipse's Maven support was terrible, and m2e hasn't gotten a whole lot better in recent years AFAIK. Back then, I used to think everything should be built and run from the command line. A couple years later, I realized it was better to run tests and debug from an IDE. Now I'm more concerned with the ability to run tests and debug in an IDE than I am from the build system. In reality, it probably doesn't matter which IDE you use, as long as you're productive with it. Once you learn one IDE well, the way others do things will likely seem backwards. I'm so familiar with debugging in IntelliJ, that when I tried to use Eclipse's debugger a few weeks ago, it seemed backwards to me. In a nutshell: the technologies I've worked with have been better embraced by IntelliJ. Has this happened to you? Have certain technologies caused you to use one IDE over another? Over the last several months, I've been developing a REST API using Spring Boot. My client hired an outside company to develop a native iOS app, and my development team was responsible for developing its API. Our main task involved integrating with Epic, a popular software system used in Health care. We also developed a Crowd-backed authentication system, based loosely on Philip Sorst's Angular REST Security. To document our API, we used Spring MVC integration for Swagger (a.k.a. swagger-springmvc). I briefly looked into swagger4spring-web, but gave up quickly when it didn't recognize Spring's @RestController. We started with swagger-springmvc 0.6.5 and found it fairly easy to integrate. Unfortunately, it didn't allow us to annotate our model objects and tell clients which fields were required. We were quite pleased when a new version (0.8.2) was released that supports Swagger 1.3 and its @ApiModelProperty. The goal of Swagger is to define a standard, language-agnostic interface to REST APIs which allows both humans and computers to discover and understand the capabilities of the service without access to source code, documentation, or through network traffic inspection. To demonstrate how Swagger works, I integrated it into Josh Long's x-auth-security project. If you have a Boot-powered project, you should be able to use the same steps. 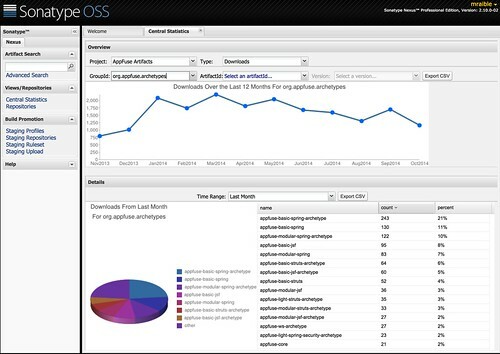 The AppFuse Team is pleased to announce the release of AppFuse 3.0. This release is AppFuse's first release as a 10-year old and includes a whole slew of improvements. In addition, this release includes upgrades to all dependencies to bring them up-to-date with their latest releases. Most notable are Spring 4, Spring Security 3.2 and Bootstrap 3. For more details on specific changes see the release notes.